On the fifth day of his presidency Clinton announced that his wife would chair his task force on national health care reform. "Of all the people I've ever worked with in my life, she's better at organizing and leading people from a complex beginning to a certain end than anybody," Clinton said. And in turning to Hillary to guide this particular initiative, which he hoped would be the defining issue of his presidency, Clinton followed a long-established pattern. Ever since his defeat as Arkansas governor in 1980, he had asked his wife to handle the most important political and policy matters of his career. But there was no anticipation of the risks in having the nation's First Lady assume an unprecedented policy role. Would advisers who disagreed with her be reluctant to express their opinions? Would the president himself show less flexibility in accepting compromises in legislation bearing his wife's imprint? Was Hillary herself endangering her larger effort to redefine the role of First Lady with an upfront role in a risky political operation? Clinton himself ignored such potential problems in the implicit faith that, as in Arkansas, she would succeed. This time, however, she did not succeed. The health care initiative did not move toward a certain end, but grew increasingly more complex. The debate over it dragged on for twenty months before it collapsed. Clinton was ultimately portrayed not as he wished to be—the victor over rising health care costs who provided insurance coverage for all Americans—but as a big-government liberal who tried to dictate and restrict medical choices. The White House set up the Arkansas model of a legislative campaign operation to push health care, with a "war room," a paid advertising effort, a grass-roots organization, and bids for corporate support. But the opposition this time, including insurance coalitions, the small-business lobby, and congressional Republicans, bested him at every turn. They conducted a more expensive and effective advertising campaign and developed a grassroots movement of their own, again relying on the conservative-radio-talk-show network. Month by month the national fervor for health care form faded. At the beginning, polls showed two-thirds of the public supported Clinton's effort, and congressional action seemed inevitable. By the end, public support had dropped below 50 percent and Republicans were opposing health care reform legislation "sight unseen." What happened? The opposition campaign was only one factor in the defeat of health care, a saga in which everything seemed to go against the Clintons. 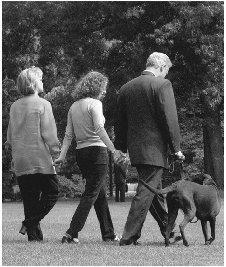 President Clinton and his family, along with dog Buddy, walk across the south lawn of the White House in 1998.
the names of the five hundred experts—including doctors, economists, sociologists, and regulators—who, in working groups, molded the plan as members of a task force. Thus, even though she held public hearings around the country and kept in constant touch with Congress, there was an overriding sense that the plan was being concocted in utter secrecy. The staff director of the undertaking, Ira Magaziner, an old friend of Clinton's from his Rhodes scholar days, correctly understood that delays could be fatal and warned him that health care must be handled quickly to get passed at all. But it was not handled quickly. First it was put off for the economic battle over the summer. Then, in the fall, it was delayed again so that Clinton could concentrate on the North American Free Trade Agreement (NAFTA), a tariff-lifting pact with Mexico and Canada signed on 8 December 1993. It was not until 1994 that Congress began considering Clinton's proposal. By then, much of the public pressure for reform had disappeared. The economic recovery that Clinton helped foster worked against him: people were less fearful about losing their jobs and health coverage, while the inflation rate in health care costs fell to a record 5 percent low during the debate. The Clinton team had started with two central health care goals. One was to contain and eventually lower health care costs for average Americans, who were spending about twice as much money for medical care and health insurance as people in other developed nations. This would be done through government-regulated "managed competition" among insurance groups and health care providers. The second objective was to guarantee health insurance for the 20 million Americans who did not have it. Clinton made the tactical mistake of emphasizing universal coverage—he would accept nothing less—over cost containment. That opened the door for his opponents to attack the plan as a liberal social welfare program. By the time congressional committees considered the Clinton proposals in 1994 they had become embodied in a 1,342-page bill, whose very length became a symbol of bureaucratic bulkiness. Conservative spokesmen were persuading the public that it forced Americans into an inefficient government-run system. Clinton could not find enough votes in his own majority party to move the measure through either chamber, and uncompromising Republicans increasingly came to embrace the strategy of denying that there was a health care crisis. In September 1994, one year after Clinton had delivered a well-received speech to Congress on the need for his Health Security Plan, Senate Majority Leader George J. Mitchell of Maine quietly pronounced it dead. Republicans and Democrats both said they would use the defeat of health care to their advantage in the November midterm elections.